The WJ120151 is one of Cartier's Pasha series model. An adorable Swiss watch that is simply a must have for watch-loving men/women. This Cartier is protected by anti reflective sapphire with case diameter of 42-millimeter. This timepiece also comes with an 18K rose gold case and a leather crocodile strap. 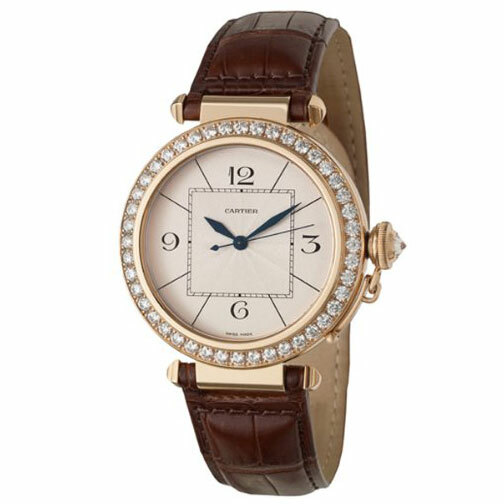 Powered by Swiss Mechanical Automatic (Self-Winding) movement, this 30 meters water resistant Cartier Pasha's original price is $41,350. Manufacturer Suggested Retail Price or Recommended Retail Price listed here may or may not reflecting the actual selling price of this watch. You should use it and/or its conversion value for estimation only. You can find an original Cartier WJ120151 Watch at the site(s) listed above. However, we don’t guarantee its availability as being listed here simply means that those site(s) has the item in question by the time we wrote the review. The review in this page is written by garnish at Monday, April 02, 2012. The post is tagged as analog, men, rose gold, watch.